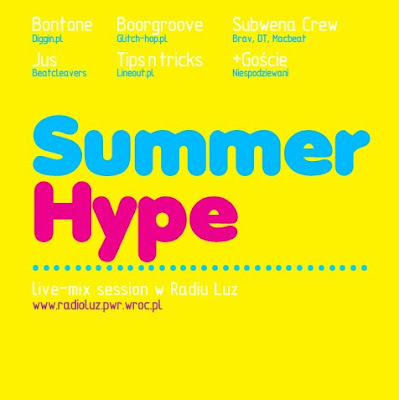 This coming Thursday (9 September 2010) at 10 p.m. (CET), one of the best radio stations in Poland Radio Luz broadcasting from Wrocław, available on 91.6 fm in this city and globally via the Internet stream - will host again a fantastic show called Summer Hype (the first edition was a great success!!) showcasing the young talents of the Polish glitch-hop / dnb / dubstep / beatz / hip hop / UK G & F scene with a special guest from Southampton (UK) - DJ Jus associated with Beat Cleavers collective, a mad turntablist and beatmaker. You should definitely check the beats and pieces served by him along with local Wrocław's heavy-weight champions - Bontone, Boorgroove, Subwena and Tips'n'Tricks. From 80 to 140 bpm, from dnb to wonky and back. Spontaneity guaranteed! When you hear more glitch than usual, please do not fine-tune your radio, just enjoy the sound!